Thanks to the combined efforts of my dear Marli and our awesome buddy Kaijuu my study in the attic now has a nifty hifi setup. 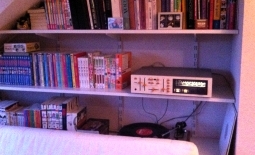 You may recall that Marli brought home a record player, an amp and boxes full of records. Well, recently Kaijuu set me up with two of his old Technics speakers which, despite being huge and looking worse for wear, still provide excellent sound. So thanks to them, tonight's volunteer work is accompanied by Back, Dvorak and a selection of operetta. Sadly, both the record player and the amp are showing their age: on some records the audio sounds rather fuzzy and the needle picks up plenty of pops and ticks. Hopefully that's something we can work on the next few months. I'm hard at work this Friday night, working on the new Renshinjuku website! I'm putting the final touches to the set of plugins and am translating all content to dutch as well. I was very happy to learn about qTranslate, a Wordpress plugin which makes multi-lingual websites a snap! Couldn't have done it without qTranslate! Once I'm done, there's admin-work to be done: write a manual for our dojo officials, provide documentation and then hopefully we can quickly migrate the site to production. As I wrote last week I've been lazy. So to get back into the game I'm teaming up with my sempai Jeroen and Martijn. 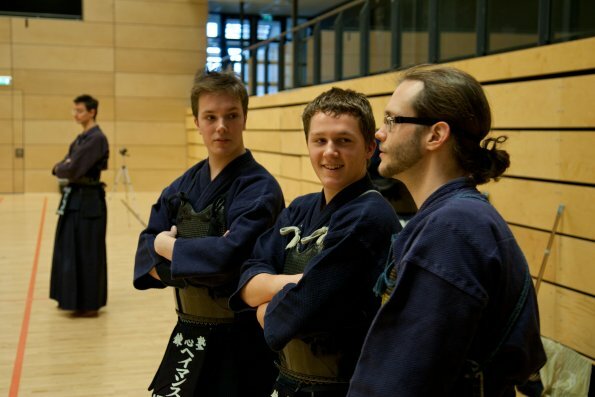 Last night, Jeroen visited for an hour of kendo and muscle training (followed by some geekery). Aside from the basic stretching and suburi, he taught me some things about pushups, in order to improve the muscles in my shoulders and arms. The basic regimen to start me off is X reps of 5x normal, 5x wide, 5x narrow, which ought to get me started. Many thanks for that! Now all I need to do is follow through and actually DO this stuff. My form and breathing in kendo are improving again, back towards their old state, but it requires constant reminding. I need to actively think of every step, to ensure I'm doing it right. After going for 100 hayasuburi (which Martijn achieved last week) my blistered left hand blistered some more and drew blood. Jeroen sempai made it to 130/140, while I caved around 70 :| That was down to my technique, because I started really shoving and yanking my shinai after 50, when my arms got tired. Form, form, form! Three more weeks until class starts again in Almere (or two until Amstelveen). Need to get cracking!